For many devices and loads, such as LED lamps, arise at start-up increased input currents. If these loads are switched on by an upstream relay in a controler, these short-term high inrush currents lead to an overload of the relay. For recurring switching operations, the relays fail. The inrush current limiter LOGO! ICL230 actively reduces the inrush currents and prevents the failure of the relay contacts. The SITOP inrush current limiter, which is already in the product range today, input: AC 100-480 V, 10 A max., output: AC 100-480 V, 10 A max., remains on offer. The LOGO! ICL230 is a device with an input voltage range of 100 – 240 V AC and an output voltage range of 100 – 240 V AC with a max. rated current of 5 A. The module briefly limits the current of loads connected on the secondary side to 10 A at the moment of switch-on and can be used as upstream or downstream device. The LOGO! ICL230 module can be used in the following application scenarios. Upstream device of 230 V AC LOGO! modules (LOGO!Power or LOGO! 230RCE/RCEo basic modules), SITOP power supplies or additional power supplies to reduce inrush currents, especially when using multiple 230 V devices at one infeed. Normal operation: Disable the current limitation to minimize the power loss, which means the rated current must not exceed 5 A in normal operation. Interrupting the mains supply: The inrush current limiter limits the inrush current once again to 10 A for about 60 ms with each mains interruption (off-on cycle). This depends on the duration of the mains interruption. With capacitive loads, such as LED lights, high inrush currents are present at the moment of switching. When a strand of LED lights is switched on through the downstream relay, short-term inrush currents which overload the relay are present. The relays fail in case of recurring switching operations. The inrush current limiter LOGO! ICL230 is a downstream device behind a LOGO! module with relay outputs that is used to safely reduce inrush currents. A failure of the relay contacts is prevented without regard for the capacitive load. The inrush current limiter limits the current to 10 A for about 60 ms when switching on. In normal operation (no switching operation of the relay), the current limitation is disabled to minimize the power loss. The rated current (sum of all loads) must not exceed 5 A. The current is once again limited with each additional switching operation of the relay. The inrush current limiter can be combined with all LOGO! basic and expansion modules with relay outputs. When operating multiple 230 V AC LOGO modules (LOGO!Power or LOGO! 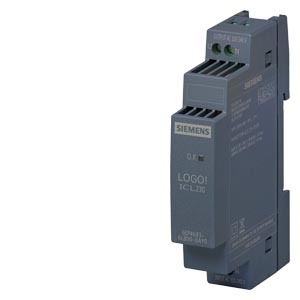 230 basic modules), SITOP power supplies or switching power supplies on one supply line, inrush currents will also occur when these are connected. The inrush currents increase the more 230 V devices are connected. As an upstream device, the LOGO! ICL230 inrush current limiter limits the inrush current and thus prevents, for example, an unintentional tripping of the upstream fuse. Technical differentiation of the two inrush current limiters is the (permanent) rated current, the possibility of connection to 1- or 3 phase networks as well as the housing dimensions.